Definition at line 61 of file llfloateravatarinfo.h. Definition at line 123 of file llfloateravatarinfo.cpp. References LLUICtrlFactory::buildFloater(), createPanelAvatar(), gAvatarInfoInstances, gUICtrlFactory, LLFloater::mAutoFocus, mPanelAvatarp, LLPanelAvatar::selectTab(), and TRUE. Definition at line 148 of file llfloateravatarinfo.cpp. Definition at line 243 of file llfloateravatarinfo.cpp. Definition at line 108 of file llfloateravatarinfo.cpp. Definition at line 237 of file llfloateravatarinfo.cpp. Definition at line 261 of file llfloateravatarinfo.cpp. 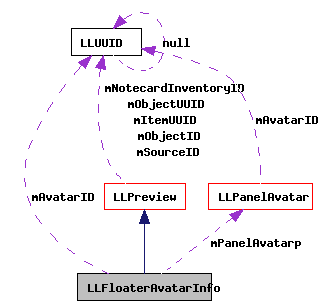 References LLPanelAvatar::haveData(), LLPreview::mAssetStatus, mPanelAvatarp, and LLPreview::PREVIEW_ASSET_LOADED. Definition at line 248 of file llfloateravatarinfo.cpp. Referenced by LLPanelAvatar::onClickCancel(), LLPanelAvatar::onClickOK(), and update_group_floaters(). Definition at line 253 of file llfloateravatarinfo.cpp. References LLPreview::mAssetStatus, mAvatarID, mPanelAvatarp, mSuggestedOnlineStatus, LLPreview::PREVIEW_ASSET_LOADING, and LLPanelAvatar::setAvatarID(). Definition at line 118 of file llfloateravatarinfo.cpp. Definition at line 155 of file llfloateravatarinfo.cpp. 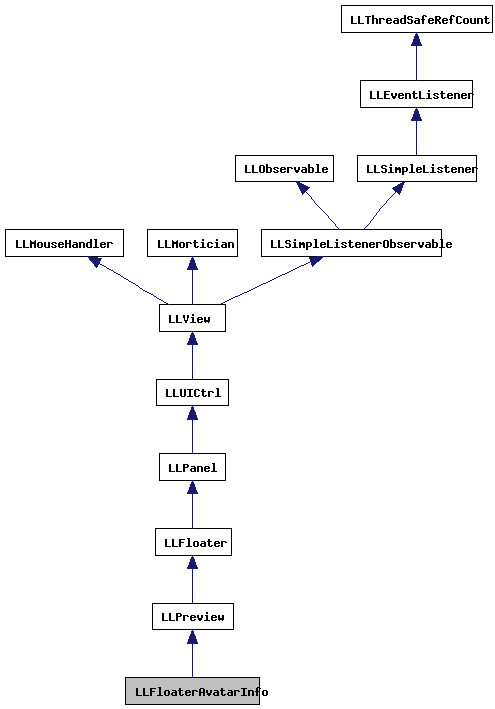 References gAgentID, mAvatarID, mPanelAvatarp, and LLPanelAvatar::resetGroupList(). Definition at line 167 of file llfloateravatarinfo.cpp. References LLFloater::center(), FAI_RECT, gAvatarInfoInstances, LLUUID::isNull(), LLFloaterAvatarInfo(), NULL, and LLPreview::open(). Referenced by LLAgentHandler::handle(), LLShowAgentProfile::handleEvent(), showFromDirectory(), showFromFriend(), and showFromObject(). Definition at line 206 of file llfloateravatarinfo.cpp. References mPanelAvatarp, ONLINE_STATUS_NO, LLPanelAvatar::setAvatarID(), and show(). Referenced by cmd_profile(), LLPanelGroupMembersSubTab::handleMemberDoubleClick(), LLFloaterInspect::onClickCreatorProfile(), LLFloaterInspect::onClickOwnerProfile(), LLPanelClassified::onClickProfile(), LLFloaterIMPanel::onClickProfile(), LLPanelActiveSpeakers::onClickProfile(), LLPanelLandObjects::onDoubleClickOwner(), and LLPanelGroupGeneral::openProfile(). Definition at line 217 of file llfloateravatarinfo.cpp. References mSuggestedOnlineStatus, ONLINE_STATUS_NO, ONLINE_STATUS_YES, and show(). Referenced by LLPanelFriends::onClickProfile(), and LLCallingCardBridge::openItem(). Definition at line 193 of file llfloateravatarinfo.cpp. References mPanelAvatarp, ONLINE_STATUS_NO, LLPanelAvatar::selectTabByName(), LLPanelAvatar::setAvatarID(), and show(). Referenced by LLPanelDirClassified::onClickCreateNewClassified(), LLPanelPermissions::onClickCreator(), LLFloaterProperties::onClickCreator(), LLPanelPermissions::onClickOwner(), LLFloaterProperties::onClickOwner(), LLPanelLandGeneral::onClickProfile(), and showProfileCallback(). Definition at line 227 of file llfloateravatarinfo.cpp. Definition at line 94 of file llfloateravatarinfo.h. Referenced by loadAsset(), resetGroupList(), and ~LLFloaterAvatarInfo(). Definition at line 95 of file llfloateravatarinfo.h. Referenced by canClose(), getAssetStatus(), LLFloaterAvatarInfo(), loadAsset(), resetGroupList(), showFromDirectory(), and showFromObject(). Definition at line 96 of file llfloateravatarinfo.h. Referenced by loadAsset(), and showFromFriend().